When you request services from us, we ask that you provide information that enables us to respond to your request. In doing so, you consent to our collection, use and disclosure to appropriate third parties of such personal information for the purposes set out above. You also authorize us to use and retain this personal information for as long as it may be required for these purposes. Your consent remains valid even after the termination of our relationship with you, unless you provide us with written notice that such consent is withdrawn. You may choose not to provide some or all of your personal information to us, but this may prevent us from providing our services to you or limit our ability to provide you with the level of service that you would otherwise expect from us as a client. “Personal information” means any information pertaining to an identifiable individual. This may include an individual’s name in combination with the individual’s address, date of birth, e-mail address, gender, government issued identification number, account number, and credit card number. This may also include any information from which a person can be identified directly, or indirectly, in particular by reference to an identification number or to one or more factors specific to their physical, physiological, mental, economic, cultural or social identity. To the extent permitted by law, personal information does not include (i) information pertaining to an organization as distinct from an individual person, (ii) the name, title, business address or office telephone number of an employee of an organization, or (iii) the name, address, telephone number or other information of a person that is publicly available (e.g. such as the information that is available in a public telephone directory). While the personal information we collect may come directly from you, it may also be provided by third parties. We may employ third party companies and individuals to facilitate our Service (“Service Providers“), to provide the Service on our behalf, to perform Service-related services or to assist us in analyzing how our Service is used. These third parties have access to your Personal Data only to perform these tasks on our behalf and are obligated not to disclose or use it for any other purpose. By utilizing Specialty Yachts’ services, you agree that Specialty Yachts may share personal information with its Service Provides for purposes relating to Specialty Yachts’ operations, maintenance, administration, improvement and client oversight. Specialty Yachts does not disclose or sell your personal information to third parties for marketing purposes. We use appropriate security measures when destroying a client’s personal information. We will continually review and update our security policies and controls as technology changes to ensure ongoing personal information security. Specialty Yachts will notify its clients as promptly as possible of any privacy breach after discovering or receiving notification of the breach if Specialty Yachts reasonably believes the information has been acquired by an unauthorized person or is subject to an unauthorized use. Upon request, you may access certain personal information collected by Specialty Yachts that Specialty Yachts maintains at the time of your request. Specialty Yachts will provide reasonable and practical access to your personal information in accordance with any applicable laws. Details of how to contact us are set out below. There may be instances where Specialty Yachts cannot provide you access to your personal information, for certain reasons, including, but not limited to, it has been destroyed or deleted after expiry of applicable retention periods, it contains personal information of other persons, or it contains commercially sensitive or proprietary information owned by us. If we are unable to provide you access, we will explain why and document that for our records. A minimal fee may be charged for providing access to personal information. Where a fee may apply, we will inform you of the cost and request further direction from you on whether or not we should proceed with the request. We rely on you to keep us informed of any changes in your contact information or personal information, such as a change of address, telephone number, or any other circumstances. Please contact one of our customer service representatives or our Privacy Officer, to verify or amend the information we have about you. When reasonable and commercially practicable, Specialty Yachts, upon notice, will correct any inaccuracies in your personal information. Use of Internet Protocol (IP) Addresses: An IP address is a unique number that is automatically assigned to your computer, smart-phone or other device whenever you are surfing the Internet so that your computer, smart-phone or device can be identified by the main computers, known as Web servers that serve webpages. This allows us to identify and gather general information about your use of Specialty Yachts’ products and services. Specialty Yachts’ website, products or services, may use “cookies” to help you personalize your online experience. A cookie is a text file that is placed on your hard disk by the webpage server. Cookies cannot be used to run programs or deliver viruses to your computer. Cookies are uniquely assigned to you, and can only be read by a web server in the domain that issued the cookie to you. One of the primary purposes of cookies is to provide a convenience feature to save you time. The purpose of a cookie is to tell the web server that you have returned to a specific page. This simplifies the process of recording your personal information, such as contact information and so on. You have the ability to accept or decline cookies. Most web browsers automatically accept cookies, but you can usually modify your browser setting to decline cookies if you prefer. If you choose to decline cookies, you may not be able to fully experience the interactive features of Specialty Yachts’ website, products or services. Specialty Yachts has designated individuals to act as Privacy Officers, responsible for ensuring compliance with this Policy, the PIPA and the PIPEDA.  Questions and complaints regarding Specialty Yachts’ handling of personal information should be directed info@specialtyyachts.com or to Specialty Yacht Sales Ltd. at #102 – 1676 Duranleau Street, Granville Island, Vancouver, BC V5H 4K7, Canada – Attention Privacy Officer.